The perfect traditional Cypriot Talatouri sauce recipe! Talatouri sauce, is a traditional Cypriot dip, that is known and loved around the world. Velvet, thick and rich, talatouri is the ideal match for grilled meat! Cypriot Talatouri sauce recipe – Mint or no Mint? Everyday we receive messages from our readers, asking if the traditional Tzatziki recipe is using mint or not, and if lemon juice or vinegar. So we decided to write about this traditional Cypriot dip, that is called Talatouri, which is also a yogurt based sauce very similar to Greek tzatziki. The traditional Cypriot Talatouri recipe is made with fresh or dry mint and lemon juice instead of vinegar. These are the main differences from the Greek version of Tzatziki sauce, but we love them both! Hope you enjoy it! 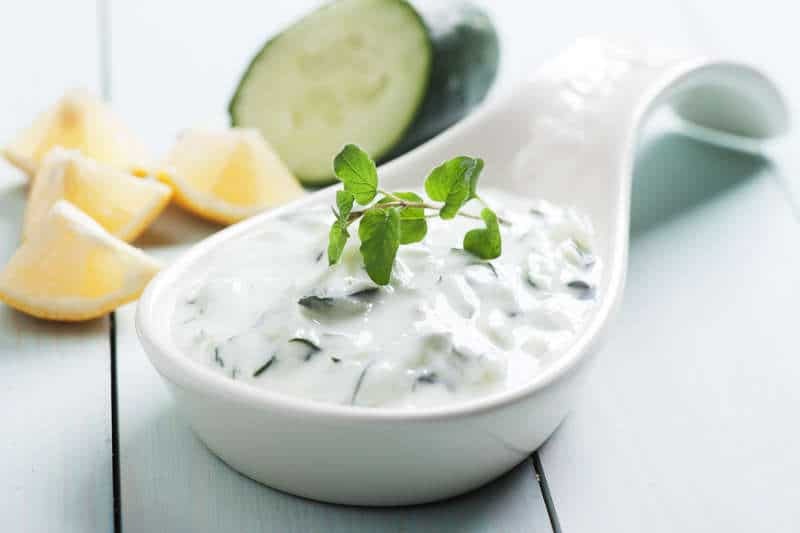 Talatouri is a classic yogurt, garlic and cucumber sauce. It is a very simple and easy recipe, but in order to achieve the perfect texture you have to pay attention to the details. The main ingredients for this traditional Cypriot Talatouri sauce recipe are plenty of garlic and creamy thick Greek yogurt. If you like garlic then this is definitely a recipe made for you and if you are not afraid of the smell use a little extra… Your tastebuds will thank you! Probably the most important part when making a Cypriot Talatouri sauce recipe is the preparation of the cucumber. You need to use seedless cucumber or if you are using a seeded one, make sure to remove the seeds. Cucumer seeds bring along a little too much moisture in the Talatouri sauce, so their texture is not what we are looking for. Grate the cucumber, using the large holes of the grater and dry it really well. We want to remove as much of the moisture of the pulp as possible, so that the Talatouri remains creamy. When preparing this traditional Cypriot Talatouri recipe, it is very important to use the garlic minced or grated (not chopped) in order to avoid lumps and a mouthful of garlic.. For that perfect velvet and rich texture make sure to use Greek strained yogurt, as it is smoother and creamier than other yogurts and make sure to use it cold. Enjoy this authentic Cypriot Talatouri sauce recipe with a juicy souvlaki or with some warm pita breads! To prepare this traditional Cypriot talatouri sauce recipe, remove the skin and the seeds of the cucumber and grate it into a large bowl. Season with salt and pepper and leave aside for 10 minutes. Wrap the grated cucumber in a towel and squeeze, in order to get rid of the excess water. Assemble the Talatouri sauce. In a bowl, add the cucumber, the minced garlic and olive oil, the yogurt, juice of 1 lemon, mint, a pinch of salt and blend, until the ingredients are combined. Store in the fridge and always serve cold. (Alternatively, if you have a blender, pour in the olive oil and garlic and blend until combined. Then mix with the rest of the ingredients using a spoon. This will help the garlic to mix better with the rest of the ingredients). Prepare this traditional Talatouri sauce for your friends and family and serve as a delicious dip with some warm pita breads aside, or as a sauce for Greek-style souvlaki. Enjoy!